Features such as a navigation system, stability control and even traffic-adaptive cruise control were once the domain of high-priced cars, but now they are commonplace on even budget models. Automated driving is a hot topic in the car business, with automakers racing to be the first to bring a self-driving vehicle to market. But there’s a long way to go until the concept is truly realized. Despite what some Tesla owners seem to think, the carmaker’s Autopilot system is not a substitute for an alert driver. The person at the wheel must remain hands on and eyes up. But it is one of the better automation systems available, and Tesla’s lowest-priced vehicle, the Model 3, has it. In a few of its vehicles, such as S-Class models, Mercedes-Benz has a similar “partial driving automation system,” to use the latest definition from the Society of Automotive Engineers. But the Mercedes system isn’t as well-tuned for real-world usability. Its highest level of automation, Active Distance Assist Distronic, slows the car to uncomfortably low speeds when approaching curves or toll booths and limits the speed to the posted limit. Tesla has its issues, too. In Autopilot mode, it will occasionally stray if the lane markers are faded, which can be alarming at 65 mph. Both do a better job in dense, stop-and-go traffic. 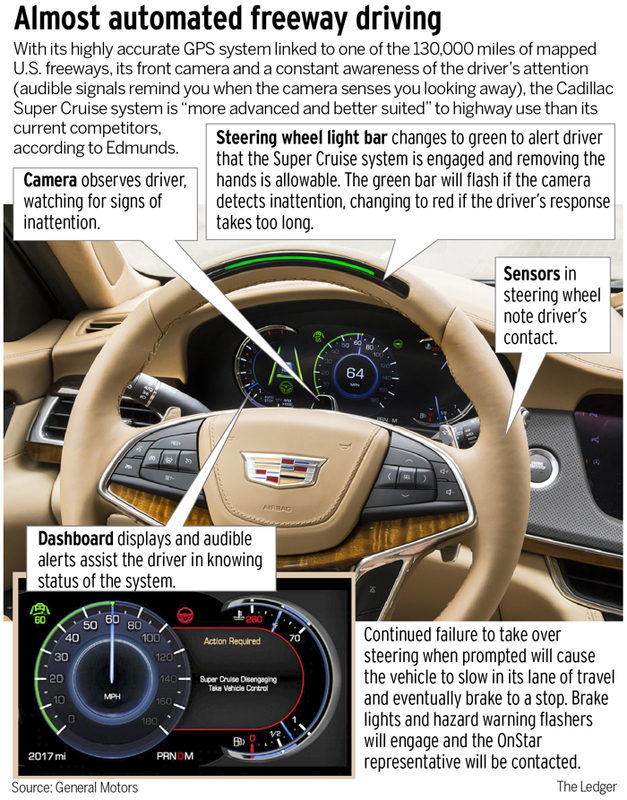 Cadillac’s Super Cruise system is more advanced and better suited for highway use, using mapping and GPS data to “geofence” its operation. That may sound limiting, but in conjunction with Super Cruise’s myriad sensors and cameras, mapping makes the system more sophisticated and less susceptible to misuse. For Super Cruise to function hands-free, you need to be on one of the 130,000 miles of mapped freeways in the U.S. and keep an eye on the road. And, yes, there are sensors in the cabin to ensure you’re doing that. These vehicles also have emergency stop assistance, which senses if the driver has become unresponsive. If that happens, the system can slow the vehicle to a stop within its lane, activate the hazard lights and summon emergency services. Some current Tesla, BMW and forthcoming Audi models will squeeze themselves into and out of tight parking spaces remotely – you don’t even need to be in the car. Premium audio options are easy to find, but audiophile-level systems remain exclusive to luxury vehicles. For about $2,000, a powerful 23-speaker Mark Levinson surround-sound system can be added to a Lexus LS sedan. That represents one of the more desirable yet affordable choices. At the upper end of the price spectrum, you can spend upward of $7,500 for a Burmester audio upgrade in a Porsche Panamera and more than $9,000 for the Bespoke audio package in a Rolls-Royce Ghost Series II. There’s a lot of tech in luxury vehicles and more on the way. If you’re an early adopter on a budget, just wait a few years. Most legitimately useful features will eventually be available on more affordable cars.